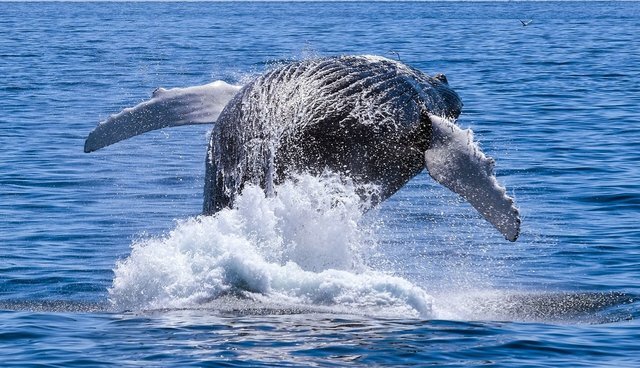 In a historic victory for marine mammals, a federal court ruled that the National Marine Fisheries Service (NMFS) was wrong to allow the Navy to cause the injury or death of approximately 9.6 million marine mammals, including whales, dolphins, and sea lions. This court's ruling marks an exciting victory for environmental and animal protection groups, including the Animal Legal Defense Fund (ALDF), led by the Natural Resources Defense Council (NRDC). Courts generally review federal agency decisions with tremendous deference to the agency's discretion. Whales and other marine mammals rely on their hearing for orientation and communication, to find a mate, and to find food. It is how they "see" the world. The Navy sonar tests, approved by NMFS, involve creating sounds thousands of times louder than a jet engine. The results can be devastating and cause irreversible hearing loss, reproductive decline, changes in migratory patterns, and death. The Navy's own environmental review estimates that sonar tests, underwater explosions, and gunnery exercises will potentially harm animals nearly 10 million times in a five year period (2013 to 2018), kill 155 animals, and cause 2,000 instances of permanent injury. Endangered blue, fin, humpback, and beaked whales are vulnerable to these harms, as well as dolphins and sea lions. In 2000, whales of four different species became stranded on beaches in the Bahamas. Government investigations proved that mid-frequency sonar - which is what the Navy uses - was the cause. Strandings like this have occurred in recent years around the globe - in the Canary Islands, Greece, Madeira, the US Virgin Islands, Hawaii and beyond. The NMFS is charged with protecting these animals and upholding the Endangered Species Act and the Marine Mammal Protection Act. When the agency permitted the Navy's plan to move forward in January 2014, the NRDC-led coalition filed its lawsuit. But this week, the court ruled in favor of the plaintiffs and agreed that the Navy's tests violated federal animal protection laws. In fact, in its 66-page opinion, the court agreed the justification for permitting the Navy's plan felt a bit lost at sea. "Searching the administrative record's reams of pages for some explanation as to why the Navy's activities were authorized by the National Marine Fisheries Service ('NMFS'), this court feels like the sailor in Samuel Taylor Coleridge's 'The Rime of the Ancient Mariner' who, trapped for days on a ship becalmed in the middle of the ocean, laments, 'Water, water every where, Nor any drop to drink.'" And, as we explored in ALDF's interview with Joshua Horwitz, author of "The War of the Whales," animal protection and environmental concerns do not have to conflict with issues of national security. The famous movement to "save the whales" originated from the Navy's controversial testing activities in the tracking of enemy submarines. The Navy has reasonable alternatives to the use of high-intensity soundwaves, and it is time for NMFS to compel the Navy to employ limits and alternatives in accordance with the law. As Horwitz noted, "that's why the work of groups like NRDC and ALDF is so important: to keep large federal agencies like the US Navy accountable to federal law." But the National Marine Fisheries Service must also meet its mandate for upholding animal protection laws. Certainly, those who care about marine mammals, and the federal laws set in place to protect them, should be buoyed by this good news. We await the court's decision on an appropriate remedy to protect these vulnerable animals from further harm. For more on this story, read ALDF's joint press release with NRDC and coalition members, and stay tuned for further developments!